The new E400's twin-turbo V-6 replaces the E350 V-6 in coupes and sedans and the E550 turbo V-8 in sedans. It's a confusing replacement that creates a slight discord between body styles. The 2015 Mercedes-Benz E-Class lineup is many vehicles in one, with comfort and luxury across the board and sporty manners for those who want them. The Mercedes-Benz E-Class is many things to many people, but at the core, the E-Class is a comfortable mid-size car that does luxury right and can even be a bit of fun to drive. The E-Class offers many different options for a wide variety of buyers. There's a traditional sedan and wagon, as well as coupe and convertible models. Add to that a choice of rear- or all-wheel drive, and five different engine options, including an AMG variant that puts out up to 577 hp, a diesel, and a hybrid. Since its last full redesign in 2010, the E-Class has improved in several graduated steps. 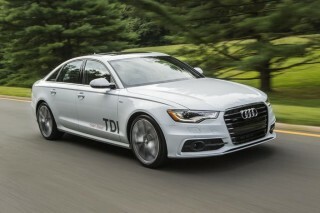 Last year brought improved fuel economy and performance, more safety technology, and a cleaner look. This year, the E-Class gets a new twin-turbocharged V-6 engine that's sprinkled throughout the lineup. For the 2015 model year the E-Class is offered as a E250 BlueTEC sedan; an E350 sedan or wagon; an E400 sedan, wagon, coupe or cabriolet; an E550 coupe or cabriolet; and an E63 AMG sedan and wagon. The E-Class' unmistakable German presence is now a bit softer, having lost its starched lines last year. Luxury models wear a three-bar grille and a star on the hood, while Sport models get the star integrated in the grille itself. The other major design changes include the clean-up of the rear quarter panels, now without the flared and creased look of the last four model years, and LED running lights and taillamps with a signature night-time look. It's less busy--maybe less interesting to some--and the new design is undoubtedly sleeker and more elegant. The E-Class' cabin fared better, especially after a recent refashioning, and the fine materials and trims we've come to associate with Mercedes are in full effect, as is the solidly constructed feel of most of the controls. It takes to expressive use of trim very well: the standard vinyl and wood can be upgraded to supple leather, aluminum or carbon-look trim, or furniture-grade wood. A huge range in drivetrain offerings almost guarantees there's an E-Class for any point on the economy/performance curve. The basic E350 gasoline engine has direct injection and makes 302 horsepower, while the 4.6-liter twin-turbo V-8 in the E550 throbs with 402 horsepower. A new twin-turbo E400 makes 329 hp, replacing the E350 in some body styles and the E550 in others. At the top of the gas-powered lineup, a spooled-up E63 AMG performance edition now churns out 550 hp from a 5.5-liter biturbo V-8--or, in "S" trim, 577 hp. Mercedes' 4Matic all-wheel drive is also optional on some coupes and much of the sedan range (and standard on wagons), and it's also standard on the AMG versions this year. Any of these versions accelerates to 60 mph in 7 seconds or less--with the AMG versions throttling the pavement into submission into as few as 4 seconds. Two green versions make the E-Class one of the few vehicles sold anywhere in the world to have gas, gas-electric, and diesel drivetrains. The E250 BlueTEC gives up some torque and a bit of acceleration to the outgoing six-cylinder E350 BlueTEC turbodiesel--but since it's a four-cylinder, highway fuel economy is 42 mpg. There's also an E400 Hybrid that shares lithium-ion batteries and motors with the S400 Hybrid, and earns a 30-mpg highway rating. The choice between the two should factor mostly on whether you post more city or highway miles, respectively. Regardless of the model or engine chosen, however, the E-Class range rewards the driver with available adjustable suspension settings, a responsive seven-speed automatic, and improved, yet still comfortable, driving dynamics. The E63 AMG kicks the whole show up a notch, with a reworked AMG-tuned suspension and lots of power. Interior space was improved with the latest E-Class redesign, with excellent head and leg room for both the front and back seats. The E-Class sedan seats five adults comfortably. Coupes and convertibles can carry four, with relatively big back seats. Wagon models have even more versatility, with fold-down seats, an open cargo space, and two temporary-duty, rear-facing third-row seats available on non-AMG models. Wagons also get a power tailgate. Across the line, build quality is tight, materials selection is mostly excellent, and quietness is a strength. Standard equipment no longer includes satellite radio, and a rearview camera is optional on the base models, but Bluetooth and a power sunroof are standard. Other luxury upgrades include voice-controlled navigation; Sirius and HD Radio; a surround-view camera; heated seats; numerous electronic safety assists; air suspension, and adaptive sport seats. The most coveted feature is sure to be the 1200-watt, 14-speaker Bang & Olufsen audio system with exquisite rendering of sound. The E-Class family offers an impressive number of above-and-beyond active-safety features--many of them optional--to detect driver drowsiness, monitor blind spots, control high beams automatically, maintain a set following distance, and help keep you in your lane. And two of the body styles have earned Top Safety Pick+ status from the IIHS. A front-mounted stereo camera system enables three-dimensional imaging of road obstacles and traffic at distances up to 55 yards, with overall system effectiveness stretching out to 550 yards. Together with driver drowsiness detection systems, forward-collision mitigation systems, braking assistance, and several flavors of lane-keeping assist, the Mercedes-Benz E-Class can even steer itself in limited circumstances while radar cruise handles speed regulation--a first step to autonomous driving. Fuel economy varies greatly depending on trim level, from 28 mpg city, 42 highway for the diesel, to 15/21 for an AMG S Model wagon. All engines are paired with seven-speed automatics, and even the performance-oriented versions include fuel-saving technologies like engine stop/start and Eco modes. Last year's subtle reworking clarified the E-Class' shape, and reinstated an imposing presence. Although there are four body styles with numerous trim levels within the E-Class lineup, they all share a cohesive, familiar design. There are different wheels, trim packages, and even LED taillights that can dress up the shape, but even basic cars are handsome, thanks to a recent refresh. As of last year, the E-Class offers two themes for standard models. You can opt for the Luxury's three-bar grille, or the Sport's plate-sized star logo embedded in a twin-louver grille, and its AMG-style trim. Bigger air intakes are faired in below on either version, but almost all the worry lines have been abraded from the front end. It's pretty and elegant, the way all E-Class cars used to be, before the detour into goggle-eye lamps. In the two-doors--the Coupe and Cabriolet--the refresh essentially takes the existing profile and carves out quite a bit more personality, with some bolder, fresher details. Most notable is how the dual headlamps have been merged together to one unit, with bright LED lightbars now visually separating them and functioning as running lamps. Sharper, more creased lower bodywork looks both sportier overall and better with the bodyside creases. And in back there's a fresh LED taillamp design. The E-Class sedan and wagon also unloaded their flared, Ponton-like rear fenders, going for a sleeker look with lower side trim that elongates the car--the preferred shortcut to "elegant." The treatment applies nicely to Coupe models, which have a graceful roofline that visually lowers the car, but it doesn't work nearly as well in Cabriolet models, where we tended to think that with the roof up the more pert roofline stretches the proportions oddly upward. Power the top down and the E Cabrio fits gracefully back in, though. The high-performance E63 AMG is easy to pick out from a distance, thanks to its unique wheels and special lower-body aerodynamic treatment. It also gets an upgraded interior. Compared to the previous generation of the E-Class, the interior of the current car feels a little more conservative, yet also modernist and less curvaceous than some of the automaker's other efforts. Sharp corners and well-pressed creases inside give the Mercedes-Benz E-Class a more traditionally luxurious look that meshes well with the new exterior. All models include wood, metal, and refined plastic trims, which you can further dress up through a long list of customization options aside from the stock choices of burl walnut or black ash. The final bit of jewelry: a tank-style analog clock on the dash. About the only thing that isn't so welcoming is the sea of matte-plastic buttons for audio and climate controls--in addition to the COMAND interface that covers infotainment through a big roller knob and a large LCD screen. Diesel, hybrid, AMG--the E-Class is one of those nameplates that stretches its performance envelope in all directions. The E-Class family of cars includes four body styles and five distinct engine choices. For 2015, there's a new E400 model that uses a 329-hp twin-turbo V-6. That makes for an amazing range of personalities in the lineup, most of which we're on a first-name basis with. 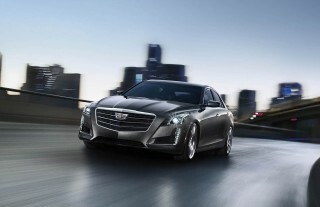 First off is that new 3.0-liter twin-turbo V-6, which develops 329 hp and 354 lb-ft of torque. E400 models are available in three of the four body styles, with the new engine replacing the E350 in the coupe and convertible lineups, and the E550 sedan going away in favor of an E400 sedan. 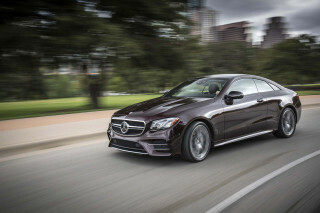 The 4Matic all-wheel-drive system is available on coupes and four-doors with this engine. Our experience with this engine in other models is positive, and it manages to split the difference between the naturally aspirated V-6 and turbo V-8 it replaces, with only a faint hint of turbo lag. The E350 continues on in sedan and wagon form for 2015. It's powered by the Mercedes 3.5-liter direct-injected V-6, which spins out 302 horsepower and 273 pound-feet of torque, with smooth power delivery and a relatively wide powerband. Zero to 60 mph times are well under 7 seconds, and top speed's 130 mph. On the E550 coupe and convertible, a 4.6-liter V-8 with twin turbochargers and direct injection makes 402 horsepower and 443 pound-feet of torque. The V-8 is a much more evocative performer than the basic six, with top speed rising to 155 mph and with 0-60 mph times falling to 5.2 seconds. These models come standard with a seven-speed automatic transmission with paddle-shift controls. They're not the most responsive automatics we've driven, better than some of the six-speeds in the luxury world, but not quite to the smooth par set by the eight-speed automatics in many other luxury models. All E-Class cars have electric power steering. The "Direct Steer" system adapts both the quickness and the weight of the steering across its dynamic range. In practice, it's given engineers a way to beef up the E-Class, and to make it feel more sporty, by adding some heft to the steering feel. There's more razor-sharp quickness with, say, the Lexus GS F-Sport's available rear-steer system, but the E-Class' system feels better than most. This E-Class comes in Luxury or Sport trim. Softly tuned, the Luxury model has ample body lean and scrubs its standard 17-inch tires easily. As a Sport, the E350 is more controlled, thanks to a suspension lowered 15 mm and to bigger 18-inch wheels. Neither removes an iota of polish from the E-Class' demeanor. All-wheel drive is an option on the E350, and E400 sedans; the E400 coupe; and standard on the E350 wagon. It brings only a slight acceleration and fuel-economy penalty. With 195 horsepower and 369 pound-feet of torque, as well as available 4Matic all-wheel drive, the E250 Bluetec sedan is very satisfying and engaging, though, with a light, responsive feel at most speeds (because there's less weight at the nose than with the previous V-6 E350 Bluetec). Only from a standing start or when ordering up a quick pass after trundling along does the diesel hesitate for just a moment more than the gasoline version. 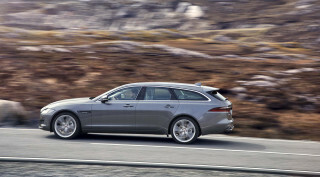 It boasts the best highway fuel economy of the whole group, at a very impressive 42 mpg. 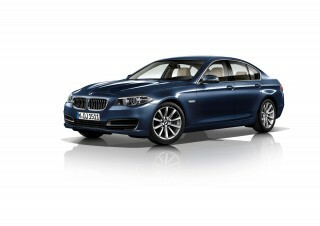 We'll have more on this model later, while we work on driving impressions of the new E400 Hybrid. 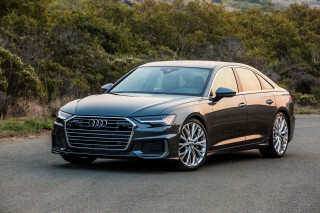 That sedan pairs the 3.5-liter V-6 with a 27-hp electric motor, start/stop, and lithium-ion batteries, just as in the S400 Hybrid. Most E-Class models have controlled and agile road manners, but they're not tuned as tautly as the sportier end of BMW's or Audi's ranges. That changes when you step up to the factory-tuned AMG car. The performance-oriented E63 AMG models got more power last year. They make 550 hp and 531 pound-feet of torque in base form, and if you spec up to the "S" model--a new sub-sub-model in the hierarchy--you'll net out at 577 hp and 590 lb-ft of torque. 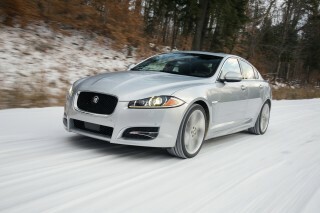 They're also equipped with standard all-wheel drive, with a fixed torque split of 33:67. The result: a scalding-hot 0-60 mph time of under 4 seconds, measured through the standard RACESTART launch control and on-screen telemetry. Top speed is 155 mph on the E63 AMG sedan, 186 mph on the E63 AMG S sedan and wagon. It's impossible to mistake the E63's stupendous performance for that of a lesser E-Class. The big, ripe exhaust noise coming from the V-8 barks out sharp orders, and the firm thump of its Pirelli P-Zero tires never intrudes as you wind the steering through visceral heft. There's no such thing as halfway here. Granted, the E63 AMG is a big car riding on a long wheelbase, and even the AWD system's power split and brake-torque vectoring can't turn it into a pint-sized flyweight. Hairpins can be hair-raisers, but sweeping turns are electric--the E63 AMG just unfurls massive power and sticks to the ground with an iron will. And the adaptive suspension keeps the car extremely well planted in any situation, with a strong, solid feel that just encourages you to go faster. E-Class wagons and sedans have fantastic seats, huge interior space, and trim worthy of a higher price point. The E-Class nameplate covers some very different vehicles. The sedan and wagon share most of their interior space and functionality, while coupes and convertibles are closer to each other, in having less of both. In front, passengers will get deep foot wells and a couple of fingers of headroom, even with the standard sunroof. The base power-adjustable seats can seem pretty pedestrian in construction--and synthetic material remains the standard base-level upholstery, though in the U.S., the majority of cars are sold with leather. AMG versions have their own grippy, highly adjustable seats, and on many versions, Mercedes offers adaptive seats that inflate and deflate air bladders in the bolsters as you push limits through corners. If it sounds gimmicky, it is, but it also works well. As for the rear seat, three adults will truly fit in sedan and wagon models, and leg and elbow room are very good for two passengers in either the E-Class sedan or wagon. The back seat itself is easy to access and flip forward for more space, thanks to a split-folding design. Coupe and Cabriolet models of the E-Class sacrifice some seating space and quite a lot of ease of access. Getting into the back seat can involve some stretching, and there isn't all that much legroom; but you'll find that the seats themselves are quite comfortable. There are only two seats in the back of the Coupe and Cabriolet, with a nice amount of breathing room in between. Small-item storage is decent, with a two-tier glovebox sized just about right for an actual pair of gloves. Cup holders are hidden beneath a slide-forward console lid, and behind and below them is a somewhat shallow storage compartment. In terms of cargo space, the latest E-Class sedans got a significant boost in trunk volume; wagons are of course the most versatile for cargo, and the non-AMG five-doors can be witted with a couple of temporary-use, rear-facing third-row seats. In all the members of the E-Class family of cars, the plush interior fittings and classy trim set a stylish baseline that can be fluffed up with designer touches. Wood trim, improved cup holders, a quieter cabin, and generally improved fit and finish add to the current generation E-Class's luxurious feel. In the richest designer trims, the E-Class carries off a much more elegant, expensive look than it does in its plainer, standard-issue form. It's also a subdued place to ride, no matter which non-AMG drivetrain you choose: cabin quietness is among the best in this class unless you do go for the most powerful models. Then it's all engine note, all the time, almost always for the better. The E-Class gained a boatload of safety tech last year; crash-test scores are good, but not perfect. 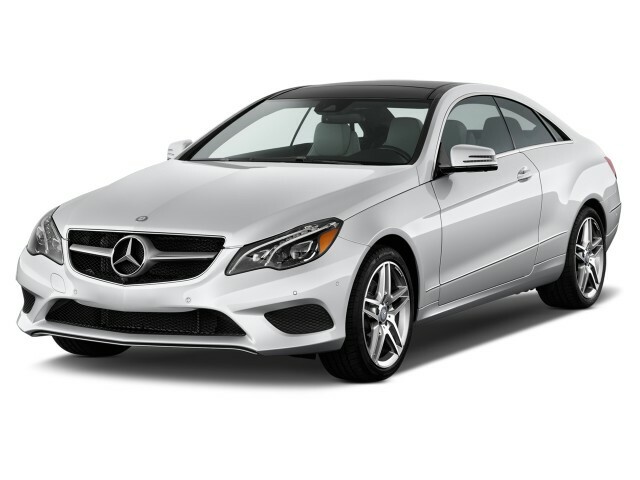 The 2015 E-Class sedan is well rated by both national testing agencies, while the rest of the body styles get good scores from the agencies that have tested them as well. Because there are so many body styles, not all of them have been examined by both groups. As of last year, the E-Class sedan and wagon also include nearly all of the top safety features introduced on the latest S-Class, Mercedes' most advanced model to date. 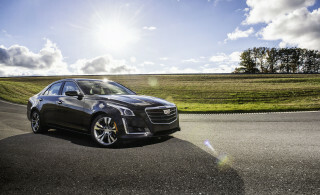 The Insurance Institute for Highway Safety (IIHS) has given the most recent two-door coupe and four-door sedan a score of "good" in all performed tests. For the sedan, that means all five test categories, which gives it a Top Safety Pick+ ranking, while the coupe has been tested in all but the new small-overlap crash test, which means it can't be considered for the award. The National Highway Traffic Safety Administration (NHTSA) gives the E-Class sedan (including the hybrid) and wagon four stars overall, with four-star ratings for front-impact tests and five stars for side crashes and rollover. The E-Class comes standard with up to eleven airbags on sedans and wagons, including a driver-side knee airbag. Side airbags for rear-seat passengers are an option, as are a rearview camera and parking sensors, while Bluetooth is standard. An available surround-view camera is similar to the one we've seen on Infiniti models--and it's an ample upgrade in safety, in seeing obstacles in any direction at parking speeds. Beyond those now-conventional features, the E-Class has been one of the first vehicles to offer some of the newest safety technology, some of it more useful than others. Among the available safety features, depending on body style, are Attention Assist, which monitors steering-wheel activity and other inputs for attentiveness and suggests a coffee stop when it senses a drowsy driver; blind-spot monitors; adaptive cruise control; automatic headlamps; and night vision. It also gets a front-mounted stereo camera system that enables three-dimensional imaging of road obstacles and traffic at distances up to 55 yards, with overall system effectiveness stretching out to 550 yards. This enables the "Intelligent Drive" suite of technologies, which includes lane-keeping assist that can steer the car gently out of the way, if an oncoming vehicle veers into its path, between about 35 and 120 mph. Not only that, by using adaptive cruise control with lane-keeping assist, the E-Class has a limited ability to steer itself in the same path as a vehicle ahead--say, at stop-and-go speeds in highway traffic--and to stay within the lines while cruising on the highway. This is about as close as any company has gotten to autonomous driving; provided the road markings are good, it works surprisingly well. A rearview camera and satellite radio aren't standard, still, but the E-Class offers surround-view cameras and 1200-watt audio systems. The major changes for the 2015 E-Class have to do with engine availability and model naming, while options stay mostly the same. 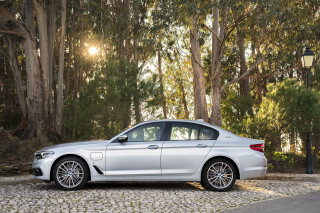 But with so many models to choose from, that means there's plenty of flexibility within the lineup, and you can make this luxury car just about as luxurious as you'd care to. All E-Class models get the standard-issue package of features and equipment, including cruise control; power windows, locks, and mirrors; power front seats; ambient lighting; a sunroof; rain-sensing wipers; an AM/FM/CD/DVD player with an SD car slot; Bluetooth; tilt/telescoping steering; dual-zone climate control; and a multi-function instrument display. Every E-Class also sports the mbrace2 smartphone connectivity suite, which integrates streaming audio via Pandora, and a host of other connected-car features. The basic E-Class also comes with M-B Tex synthetic upholstery, while leather is an option, and burl walnut or ash trim are offered. Wagons all get a power tailgate and rear air suspension, along with a small fold-out third-row seat. Major option packages include features like a rearview camera; the surround-view camera; a navigation system; satellite radio; surround sound; and heated and ventilated front seats. Parking Assist and Lane Tracking are their own packages, as is a Keyless-Go package with pushbutton start, a power trunklid closer, and a trunk opener that works by waving a foot under the bumper--a system like the one found on the Ford Escape. The Driver Assistance package bundles Brake Assist Plus, Pre-Safe functions, Distronic radar cruise with steering, Active Blind Spot assist, and Active Lane Keeping assist. Most E-Class sedans and wagons are trimmed out as Sport models, which include sport exhaust tips, 18-inch wheels and tires, and distinct gauges, along with a trimmer grille with an outsized Mercedes logo at its center. A minority of E-Classes are Luxury models, with 17-inch wheels and tires and a three-slat grille with a discreet Benz badge at the top. Stepping up to the top-of-the-line E63 AMG gets you upgraded materials throughout, including a flat-bottom steering wheel and Alcantara trim, plus AMG badges and performance-tuned stability and traction electronics--in addition to a high-performance transmission and the AMG-built 550-hp or 577-hp V-8. A nice, round, 200-mph speedometer is also included. We'd definitely recommend the "S" upgrade, with carbon-ceramic brakes, red brake calipers, and the higher output--but we'd also save room for the $6,400 Bang & Olufsen sound system, with 1200 watts delivered through 14 speakers. The E-Class' fuel-economy ratings are jarring on the page, ranging from excellent diesel and hybrid numbers to less stellar AMG figures. The Mercedes-Benz E-Class is one of the few vehicles that covers all of the most commonly available engine types. Available powertrains span pure gas, a gas-electric hybrid, and a very efficient diesel. Starting with the more efficient options, the E250 BlueTec sedan is rated at 28 mpg city, 42 mpg highway with rear-wheel drive and 27/38 mpg with 4Matic all-wheel drive. The E400 Hybrid sedan comes in at 24/30 mpg. The new twin-turbo V-6 E400 has not yet received EPA ratings. As for the other gas engines, the E350 sedan rates up to 21 mpg city, 31 mpg highway. Stepping through the all-wheel-drive versions of the four-door and wagon, and the two-door coupe, brings mileage down to 20/28 mpg, a bit lower for some of the other body styles. The high-performance E63 AMG models are rated as low as 15 mpg city, 23 mpg highway--or 15/21 for the new E63 AMG Wagon. Great family car with attention-getting street presence. Wonderful family car. Versatile and stylish. Beautifully crafted and elegant drive. A wonderful road and about town car. This is one superb car. 0-60 in 4.2 seconds, 1/4 mile in 12.4 seconds. And comfortable and quiet! No wind noise. Heavy acceleration produces a low V8 rumble from the exhaust. And its handling, especially using... This is one superb car. 0-60 in 4.2 seconds, 1/4 mile in 12.4 seconds. And comfortable and quiet! No wind noise. Heavy acceleration produces a low V8 rumble from the exhaust. And its handling, especially using Sport mode, is firm with very little body roll. The interior is gorgeous. Best I have ever sat in. Looking for a different year of the Mercedes-Benz E Class?